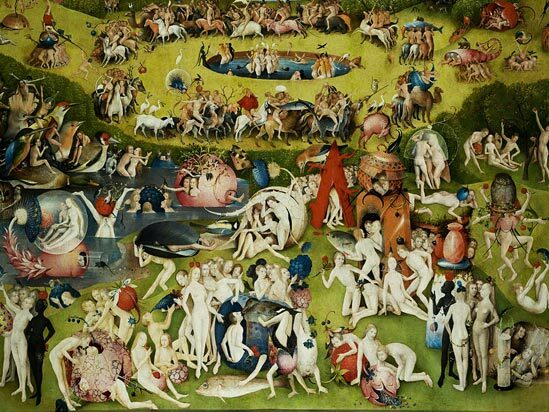 The painting of El Bosco is inhabited by a multitude of individuals that exercise their individuality in relation to the choice of an activity, always accompanied by other individuals and beings. Their action of inhabiting is established in a place declared garden (for us, a world) that is limited as a space that transits between the earth and celestial planes. In the earth plane the individuals discover the first objects and inhabitable beings: the shelter of molluscs in movement, the protection of a transparent bubble, the shared room in the interior of a fruit that blooms, the comfort of a filamentous and perishable skin capable of identifying with its next dweller... all those casual dwellings reach their domestic plenitude under the shelter of the tree, where the periodic nature of a time with its fruit-sustenance is born.